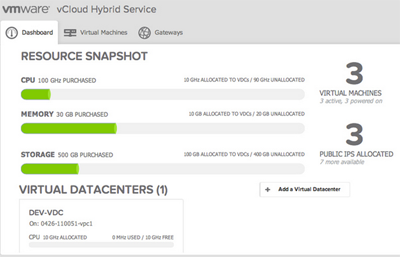 VMware's vCloud Hybrid Service will be commercially available in the U.S. starting in September. VMware vCloud allows users to migrate VMs on demand from their "internal cloud" of cooperating VMware vSphere hypervisors to a remote cloud of VMware vSphere hypervisors. The service is hosted in three U.S. data centers: Santa Clara, California, Sterling, Virginia, and Las Vegas, Nevada. VMware has formed a partnership with Savvis (see below) to accelerate adoption of vCloud Hybrid Service. vCloud Hybrid Service Virtual Private Cloud will offer multitenant compute with full virtual private network isolation. Virtual Private Cloud pricing starting at 4.5 cents an hour for a fully protected, fully redundant 1GB virtual machine with 1 processor." 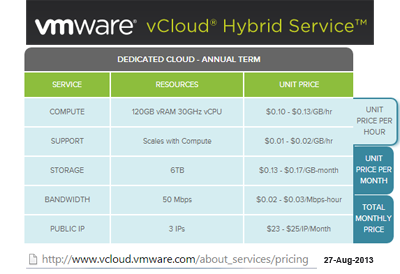 "Since its debut on May 21, VMware vCloud Hybrid Service has experienced great momentum and success with an over-subscribed Early Access Program, acquiring a strategic beachhead of customers taking full advantage of the ability to extend their applications to the cloud," said Bill Fathers, senior vice president and general manager, Hybrid Cloud Services Business Unit, VMware. "With the new data centers and important new capabilities, we're executing quickly against our vision of a hybrid cloud service that is completely interoperable with existing infrastructure and enables new and existing applications to run without compromise." Direct Connect: customers can connect their data center network directly to vCloud Hybrid Service over private dedicated networks. Direct Connect will be available in October with a list price of $75 per port per month for a 1GB connection and $250 per port per month for a 10GB connection. Disaster Recovery as a Service: automatically replicates applications and data to vCloud Hybrid Service, providing rapid automated recovery in the event of an outage. Cloud Foundry Platform as a Service: provides full support for the open source Cloud Foundry distribution and Pivotal CF. Cloud Foundry allows customers to avoid the complexity of re-architecting of applications to make them run well on public clouds, and avoids lock-in to proprietary cloud APIs. VMware Horizon View Desktop-as-a-Service: Customers will be able to run Horizon View Desktops on vCloud Hybrid Service, and rapidly deploy new desktops without the expense and effort of procuring and managing physical hardware. 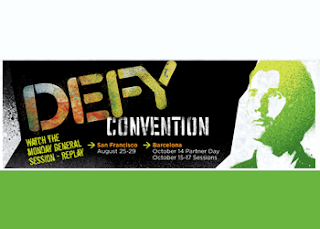 VMware also noted that it is working with channel partners, including CDW, SHI, Presidio, ePlus, and Insight. 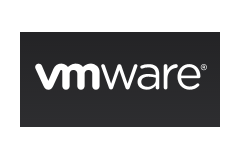 Savvis and VMware announced a partnership focused on VMware vCloud Hybrid Service, which allows users to migrate VMs on demand from their "internal cloud" of cooperating VMware hypervisors to a remote cloud of VMware hypervisors. Savvis, which is the enterprise IT infrastructure arm of CenturyLink, is deploying instances of VMware vCloud Hybrid Service within its North American data center footprint in 2013 and 2014. 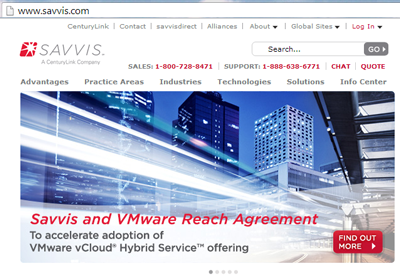 Savvis will offer complementary, secure low-latency network services for VMware vCloud Hybrid Service customers using the CenturyLink global network. VMware has also agreed with Savvis to be its hosting partner in the U.S. and Canada. "Savvis is proud to expand our VMware partnership to integrate our offerings with VMware vCloud Hybrid Service," said Jeff Von Deylen, president of Savvis. "Customers using VMware vCloud Hybrid Service will benefit from our broad portfolio of network, colocation, managed hosting, managed services and cloud services to enable custom IT solutions. Hybrid cloud customers are looking for the kind of secure, low-latency network connectivity solutions that Savvis and CenturyLink can provide." "Building on VMware's longstanding relationship with Savvis, this alliance will enable new and existing business applications to run seamlessly both on- and off-premises," said Bill Fathers, senior vice president and general manager, Hybrid Cloud Services Business Unit, VMware. "Customers can gain new data center locations for vCloud Hybrid Service and complementary network, colocation, hosting and managed services from Savvis to accelerate their move to cloud." Launched the Savvis Cloud Ecosystem, which focuses on innovative technology partners using VMware's vCloud API. Announced the global availability of Savvis Cloud Data Center, which is based on the latest version of VMware vCloud Director orchestration platform. Joined the Cloud Foundry advisory board, which was recently established by Pivotal, to help guide the Cloud Foundry ecosystem as it fosters a platform for developers in an open and innovative community. Brocade announced a new network virtualization gateway for bridging logical networks with physical resources using the VMware NSX network virtualization platform in order to provide a unified data center. 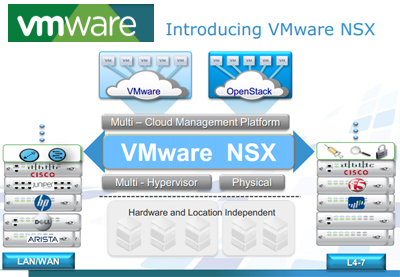 The gateway involves the integration of VMware NSX with Brocade's VCS Fabric technology. 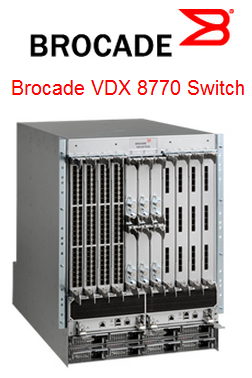 The Brocade VDX switch family, running VCS Fabric technology, serves as the foundation for the new gateway. 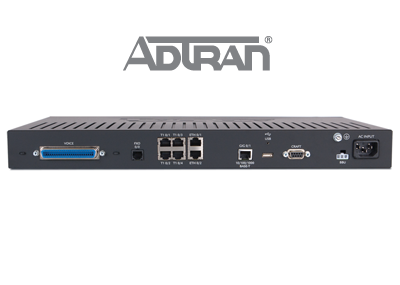 It can be deployed as a single switch or as a highly resilient fabric of switches, such as for connecting mission-critical applications and storage data. Tunnel connections are translated into IP connections for bare metal servers running non-virtualized applications, physical storage devices or specialized hardware running network services. VXLAN support is integrated within the Brocade VDX custom ASIC, enabling high gateway performance. "Today's introduction of the Brocade VCS Gateway for VMware NSX advances the capabilities of our VCS Fabric technology by unifying physical and virtualized resources within the data center," said Jason Nolet, vice president, Data Center Networking, at Brocade. "The Brocade VCS Gateway for VMware NSX provides our joint customers with an essential element for ensuring consistent and seamless connectivity between virtualized workloads and physical resources within the data center." "Our collaboration with Brocade has resulted in an integrated solution that can deliver an agile, scalable network infrastructure," said Hatem Naguib, vice president, cloud networking and security, at VMware. "Brocade and VMware are helping customers integrate physical and virtual networks that can be viewed and managed as a single unified infrastructure. 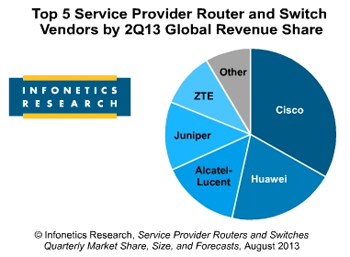 This will help customers radically simplify IT through a new network operations model." 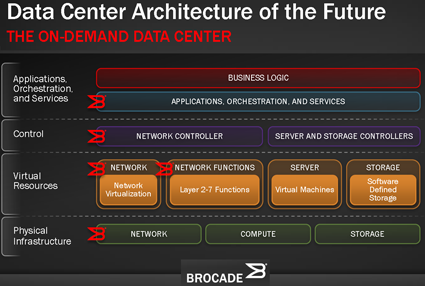 Brocade anticipates launching its VCS Gateway for VMware NSX in Q4 2013. In September 2012, Brocade has expanded its set of VDX fabric switches for the data center with a new VDX 8770 model designed for enterprises and service providers striving to both simplify and scale-out their data center infrastructure. The modular Brocade VDX 8770 Switch is built to support the largest data centers with highly virtualized environments. The Ethernet fabric enables faster virtual machine (VM) migrations through zero-touch VM discovery, VM mobility and VM port configuration migration. Using VCS fabrics, Brocade said its customers can manage dozens of switches as a single logical device. New switches will self-provision when they are connected to the fabric. The Brocade VDX 8770 enables a single VCS fabric to scale up to 8000 switch ports with up to 384,000 VMs attached to the fabric. This is 20 times the scalability of the leading competitor, according to Brocade. The Brocade VDX 8770 also delivers the industry's lowest port-to-port latency at 3.5 microseconds across all 1 Gigabit Ethernet (GbE), 10 GbE and 40 GbE ports -- half the latency of the nearest competitor. The Brocade VDX 8770 is built with a 4 Tbps backplane, enabling the chassis to support future technologies such as dense 100 GbE. Brocade said the VDX 8770 is also engineered for emerging Software-Defined Networking (SDN) architectures, with flexible hardware support for network virtualization through technologies such as VXLAN overlay networking. Trend Micro and VMware are collaborating on security for the software defined data center. 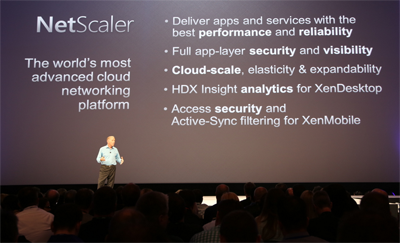 The companies will integrate Trend Micro's Deep Security with VMware NSX platform for network virtualization. 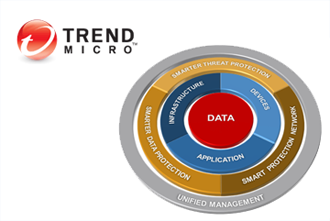 Trend Micro's Deep Security integrates anti-malware, Web reputation and firewall in addition to intrusion prevention, integrity monitoring and log inspection to protect mission-critical applications and data. The platform utilizes agentless and agent-based protection to automatically secure virtual servers and desktops, as well as private and public clouds. "As VMware launches its next-generation VMware NSX™ network virtualization platform, Trend Micro is excited to work alongside to create a comprehensive security backbone that protects the data center of the future," said Kevin Simzer, senior vice president, marketing and business development, Trend Micro. "This relationship will help simplify and automate how security is deployed, delivering reliable protection that easily scales to the needs of each customer." 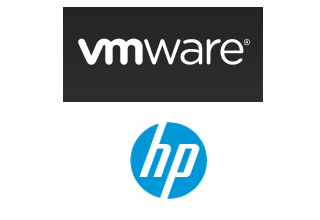 EMC and VMware agreed to collaborate on new server-based storage infrastructure for software-defined data centers. The collaboration initially will focus on the small- to medium-sized business (SMB) and small- to medium-sized enterprise (SME) markets, where customers typically use vSphere singularly across a broad set of workloads. 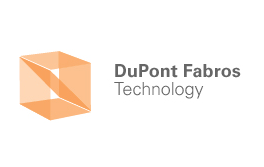 The companies building a number of development labs focused on product definition, compatibility testing, and the optimization of EMC, VMware and third-party technologies. "EMC and VMware together are defining a new class of highly integrated storage infrastructure to reduce cost and complexity in VMware environments for SMBs and SMEs. A best-of-breed offering based on the combination of VMware Virtual SAN™ with EMC's market leading storage hardware and software portfolio will help expand the market opportunity for both companies," stated Jeremy Burton, Executive Vice President, of Product Operations and Marketing, EMC Corporation. Mobily, a leading mobile broadband service provider in the Kingdom of Saudi Arabia (KSA), activated a new IP core based on the Huawei NE5000E core router. 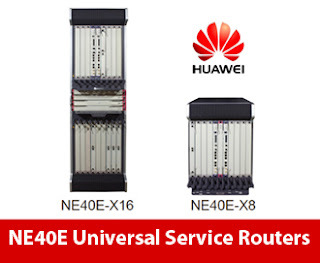 Huawei said the deployment represents the first commercial installation of 400 Gbps linecards, which support flexible networking of 100GE ports, 40GE ports, and 10GE ports. In addition, power consumption of the 400G line card is within 1 W/G. Mobily's new 400G IP core capabilities will support its UMTS/LTE, video, teleconferencing, machine-to-machine (M2M), and cloud computing services. "We aim to bring leading-edge technology and infrastructure offerings to our customers," said Mr. Nasser AL Nasser, Chief Operation Officer, Mobily. "The new 400G IP core provides excellent performance and scalability, and will allow Mobily to continue to develop its services over the coming years." "We are pleased to join Mobily in deploying the world’s first 400G IP core network," said Zha Jun, president of Huawei Fixed Network Business Unit. "Rapid development of mobile broadband and video services will generate tremendous traffic growth for backbone networks. Now is the time to apply 400G technology. Huawei is leading the development in 400G technology and fully understands carriers' network reconstruction requirements. Huawei can and will systematically improve network performance, expand bandwidth capacity, and eliminate bandwidth bottlenecks to help carriers build future-ready backbone networks." As a leader in global IP technologies, Huawei carrier IP products and solutions are serving China Telecom, China Mobile, China Unicom, and other world-wide leading carriers such as Orange S.A, Telefonica, and SingTel. 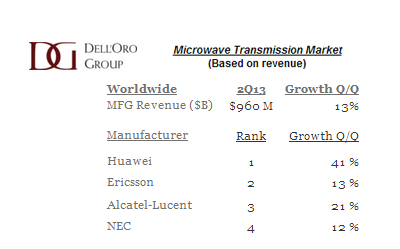 According to data from Ovum, Huawei had the highest growth rate in the global IP market in Q1 of 2013. 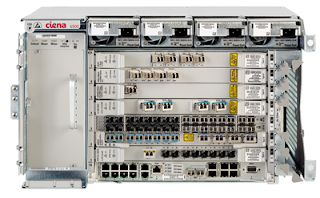 In September 2012, Huawei unveiled the industry's first and highest-capacity 480 Gbps router line card, enabling a capacity of 15.4 Tbps for its high-end core router with 48x10GE, 12x40GE, or 4x100GE line-rate forwarding per slot. Huawei will offer various daughter cards with 10GE/40GE/100GE ports for flexible configuration. Huawei said the capacity is achieved using its third-generation programmable, custom Solar 3.0 ASICs with Smart Memory and Intelligent Frequency Adjustment (IFA) technologies. The company said it is able to achieve a record-low energy use of 0.71 W/g for the line card. The London Internet Exchange (LINX) will establish a new, neutral, multi-site Internet Exchange in EvoSwitch's new WDC1 data center in Manassas, Virginia. The Exchange, called LINX USA, will be run by LINX and be closely modeled after their Exchange in London, currently one of the largest exchanges for Internet traffic worldwide. "Before we launched into the north Virginia market, we already knew we wanted a strong, neutral Internet Exchange partner to provide our customers with best-in-class peering services," said Eric Boonstra, CEO of EvoSwitch. "The North American market for network interconnection services has developed very differently from Europe. In Europe, carrier-neutral data centers work closely with neutral IXPs to provide a layer of transparent peering services that are available from multiple, competing data centers in the same market. 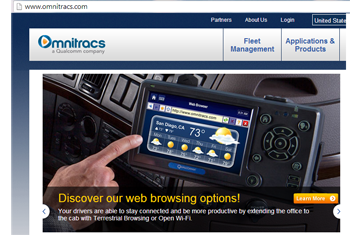 We feel that we are ideally positioned to leverage our partnership with LINX here in the US. Over time, it will provide our network and content provider customers with real choice on where to colocate, because their peering needs can be met from anywhere in any given metro market." 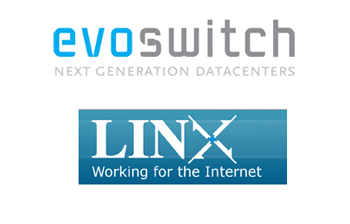 "EvoSwitch approached us early November 2012 with the idea to bring the powerful IXP model that LINX represents to the USA," said John Souter, CEO of the London Internet Exchange. "Out of those conversations, and in close collaboration with Open-IX since it was formed early 2013, we are now close to launching LINX USA in north Virginia. There is a strong demand for a change in the way networks interconnect across the United States. Neutral, multi-site IXPs where peers are members with a clear say in running the Exchange as stakeholders, provide real choice. They add resilience in the network, reduce latency and ultimately lower the cost of exchanging Internet traffic, which in the end stimulates growth which benefits all." The London Internet Exchange (LINX), which is one of the largest in the world, provides peering to over 475 members from 58 countries. The LINX London network currently handles over 1.6 Tb/sec of peak traffic and covers more than 80% of the global routing table. EvoSwitch also operates the AMS1 data center in Amsterdam. 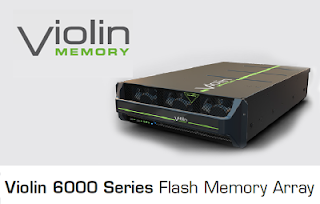 Violin Memory, a start-up offering memory-based storage systems, filed its registration statement with the Securities and Exchange Commission for the proposed initial public offering of its common stock. The number of shares to be sold and the price range for the proposed offering have not yet been determined. Violin Memory plans to list its common stock on the New York Stock Exchange under the ticker symbol "VMEM." J.P. Morgan Securities LLC, Deutsche Bank Securities, and BofA Merrill Lynch will act as lead joint book-running managers for the offering. Barclays is acting as a book-running manager. Baird and Pacific Crest Securities will act as co-managers. Earlier this month, Earlier this month, Violin Memory introduced its next generation 6264 flash Memory Array that delivers 64TB of capacity in a mere 3U footprint. The storage array combines the company's flash controller technology with Toshiba’s latest generation of 19nm flash technology, enabling twice the density and three times the economics of its predecessor while significantly reducing power consumption. Violin Memory was founded in 2005 and is based in Mountain View, California. 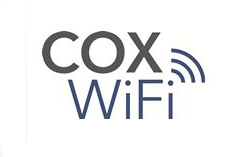 Cox Offers Access to 150,000 Wi-Fi Hotspots across U.S.
Customers of Cox Communications' Preferred, Premier or Ultimate High Speed Internet service now have access to 150,000 indoor and outdoor Wi-Fi hotspots. CableWiFI is the nation's largest WiFi network made possible by a collaboration of cable companies. More hotspots are expected to be added before the end of the year as the integration with other cable operators continues, adding major business and travel destinations such as Los Angeles and New York City to the list of cities available to eligible Cox customers. "Cox recognizes that our customers want quick access to information and entertainment anytime, anywhere. That's why we are committed to delivering a fast, reliable connection to the Internet when and where our customers need it," said Len Barlik, executive vice president and chief product officer. "Not only are we providing our customers access to nearly 150,000 WiFi hotspots throughout the country, we are also making it convenient and simple for customers to locate and logon to these hotspots." Financial Officer of Telx since 2007. Prior to joining Telx, Downie served as CFO, COO and ultimately Principal Executive Officer for Motient Corporation, a leading satellite services company. Telx operates 20 data centers in North America, including six facilities across the New York / New Jersey Metro area, two facilities in Chicago, two facilities in Dallas, four facilities in California (Los Angeles, San Francisco, and two in Santa Clara), two Pacific Northwest facilities (Seattle and Portland), and facilities in Atlanta, Miami, Phoenix and Charlotte, N.C.
One year after unveiling its architecture for software-defined data centers, VMware is updating the portfolio with four new products aimed at driving virtualization in networking, security, storage, availability, management and automation. Significantly, the announcement leverages technology from Nicira, which VMware acquired one year ago for over $1 billion. The company said its goal is to provide agility and control for building and operating private, hybrid and public clouds. The announcement coincides with the tenth annual VMworld conference, which is underway this week in San Francisco. 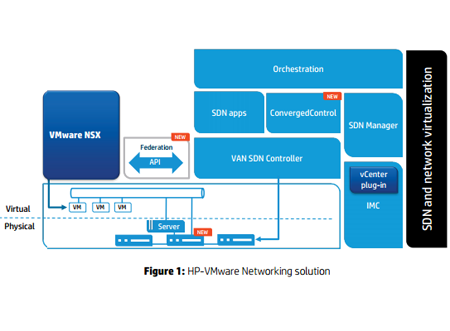 VMware NSX – a network virtualization platform that will deliver the entire networking and security model in software, decoupled from networking hardware. VMware said its approach to network virtualization enables data center operators to treat their physical network as a pool of transport capacity that can be consumed and repurposed on-demand. 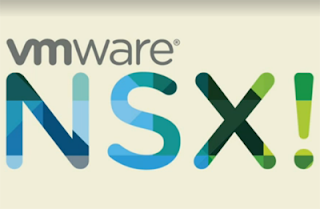 VMware NSX integrates elements of Nicira NVP and VMware vCloud Network and Security into one unified platform, delivering the entire networking and security model (Layer 2 – Layer 7) in software. In addition, the VMware NSX virtual networks support existing applications, unchanged, on any physical network infrastructure. Some other notes: VMware NSX services are integrated with the hypervisor kernel, enabling scalabilty by adding more server nodes. The company said its architecture can handle as much as 1 TB per second of network traffic per cluster of 32 hosts. VMware Virtual SAN a new technology that extends VMware vSphere to pool compute and direct-attached storage. VMware Virtual SAN will deliver a virtual data plane that clusters server disks and flash to create high-performance, resilient shared storage designed for virtual machines. It also uses a distributed architecture to enable storage services to scale out linearly with the needs of the application. Essentially, VMware said it has redefined the role of the hypervisor to deliver virtualized compute and storage services with I/O performance comparable to mid-range storage arrays while leveraging the economics of direct-attached storage. VMware Virtual SAN provides a policy-drive control plane for server-side solid state disks (SSDs) and hard disk drives (HDDs). VMware vCloud Suite 5.5 – the latest release features new and enhanced product functionality to help customers build and operate a vSphere-based private cloud using the software-defined data center architecture. The VMware vCloud Suite is built on the foundation of VMware vSphere. Enhancements include better ability to detect and recover from application or operating system failure, a flash read cache that virtualizes server-side flash, and a low-latency sensitivity feature. VMware is also now supporting Apache Hadoop and Big Data workloads on VMware vSphere 5.5. VMware vSphere with Operations Management 5.5 – which combines vSphere virtualization platform with insight to workload capacity and health. These tools help with capacity planning, monitoring and maintenance. "New products such as VMware NSX and VMware Virtual SAN will fundamentally redefine the hypervisor and its role in the data center. Along with the recently introduced VMware vCenter Log Insight, these products represent the next wave of innovation at VMware. We continue to evolve the software-defined data center architecture to address IT’s critical needs - enabling them to build infrastructure that is radically simpler and more efficient while delivering the agility and flexibility to support the velocity of their businesses," stated Raghu Raghuram, executive vice president, Cloud Infrastructure and Management, VMware. In July 2012, VMware acquired Nicira, a start-up focused on software-defined networking (SDN) for approximately $1.05 billion in cash plus approximately $210 million of assumed unvested equity awards. 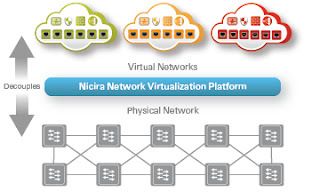 Nicira, which was based in Palo Alto, California, developed a software-based Network Virtualization Platform (NVP) that creates a distributed virtual network infrastructure in cloud data centers that is completely decoupled and independent from physical network hardware. The company says its technology "decouples and isolates virtual networks from the underlying network hardware, like server virtualization decouples and isolates virtual machines from the underlying server hardware." Nicira's NVP software is implemented at the network edge and managed by distributed clustered controller architecture. The system forms a thin software layer that treats the physical network as an IP backplane. This approach allows the creation of virtual networks that have the same properties and services as physical networks, such as security and QoS policies, L2 reachability, and higher-level service capabilities such as stateful firewalling. These virtual networks can be created dynamically to support VM mobility anywhere within or between data centers without service disruption or address changes. Sprint announced the availability of Ethernet Wave Service for business customers, promising secure, always-on wireless and wireline connectivity with maximum data security and privacy. 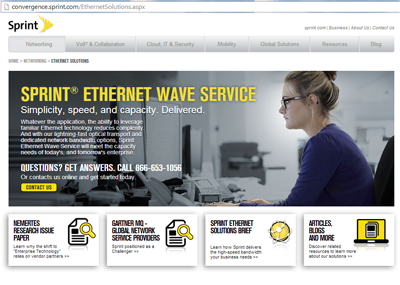 Sprint Ethernet Wave Service is now available in 88 U.S. markets and expansion will continue through 2014. As a fixed, point-to-point 100 percent dedicated high-speed connection, it offers 10 Gigabit Ethernet (GigE), 40GigE and 100GigE speeds. The secure, always-on connectivity with 24x7 network monitoring helps to ensure the service is available when needed and is performing optimally. Sprint is offering flat-rate pricing. Sprint’s Ethernet Solutions portfolio also includes Ethernet access, which is available today in 149 U.S. markets and 81 countries around the globe. Sprint said its Ethernet Wave Service is enabled by its Network Vision initiative, which uses a Ciena 6500-based architecture for delivery of 10GigE, 40GigE and 100GigE wavelengths. Sprint is leveraging Ciena’s WaveLogic 3 coherent optical processors to scale its existing infrastructure to speeds of 100G, with the ability to scale to 400G links in the future. Last month, the companies successfully completed a live 400Gbps trial on Sprint’s network in the Silicon Valley area using existing Sprint fiber infrastructure and Ciena’s 6500 with WaveLogic 3 cards. The high-capacity link operated without error. The companies said this demonstrated the viability of using 400Gbps channels alongside existing channels carrying live customer traffic. As announced in 2012, Sprint is upgrading its optical backbone network with Ciena’s 6500 Packet-Optical Platform as part of its Network Vision initiative. Ciena has been a strategic supplier to Sprint since 1998. AT&T has expanded its U-verse Internet service, offering speeds of up to 45 Mbps downstream and up to 6 Mbps upstream, coverage to 40 new markets across 15 states. AT&T's expansion of faster U-verse Internet speeds is part of the company's Project Velocity IP (VIP), a three-year investment plan announced last fall to expand and enhance its IP broadband networks. AT&T plans to upgrade top tier U-verse speeds to up to 100 Mbps in the future. 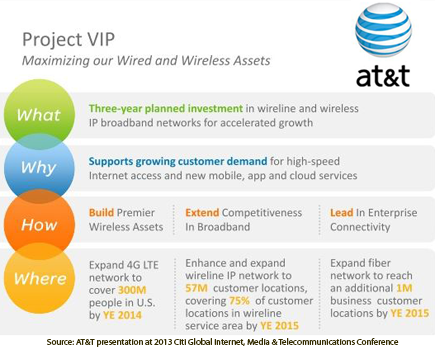 On November 7, 2012, AT&T unveiled Project Velocity IP (VIP) -- its plan to invest $14 billion over the next three years to significantly expand and enhance its wireless and wireline IP broadband network. The plan adds $8 billion for wireless initiatives and $6 billion for wireline initiatives. It also makes a distinction between areas where the company believes are better served wirelessly rather the through a traditional copper network or deploying a fiber infrastructure. Total capital spending is now expected to be approximately $22 billion for each of next three years. The company said a stronger balance sheet has provided it the financial footing to invest. AT&T is also increasing its quarterly dividend 2.3 percent and is predicting EPS will grow by mid-single digits for the next 3 years with opportunity for stronger growth going forward. The Project VIP plan includes an upgrade for U-verse to speeds of up to 75Mbps and for U-verse IPDSLAM to speeds of up to 45Mbps, with a path to deliver even higher speeds in the future. In the 25 percent of AT&T's wireline customer locations where it's currently not economically feasible to build a competitive IP wireline network, the company said it will utilize its expanding 4G LTE wireless network -- as it becomes available -- to offer voice and high-speed IP Internet services. 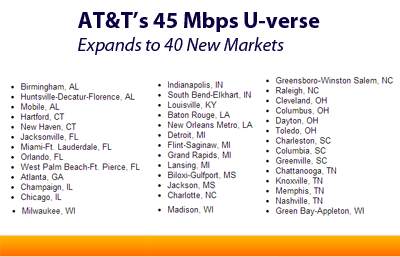 The company's 4G LTE network will cover 99 percent of all in-region customer locations. AT&T's 4G LTE network offers speeds competitive with, if not higher than, what is available on wired broadband networks today. Gigamon announced the latest release of its GigaVUE H Series software, Version 3.1, offering enhancements to Flow Mapping as well as support for role-based access control and advanced workflows for independent and concurrent monitoring policy configurations. 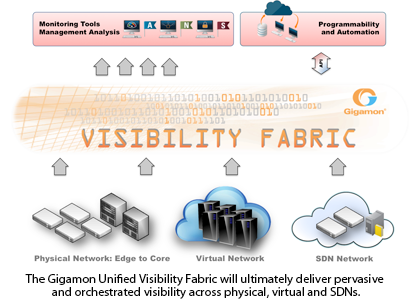 This provides the ability to virtualize the Visibility Fabric. The company said these new capabilities will enable enterprises to offer Visibility as a Service to internal IT tenants, who will gain the power to dynamically change monitoring and traffic visibility policies on a per-organization or per-tenant basis without impacting other departmental monitoring polices and while maintaining compliance and privacy. "The notion of multi-tenancy has made its way from the public cloud space into enterprise IT infrastructure as well," said Shehzad Merchant, Chief Strategy Officer at Gigamon. "This solution enables network administrators and services teams to virtualize the Visibility Fabric and offer Visibility as a Service to the different IT departments." The GigaVUE H Series 3.1 software update is targeted for availability for current and future GigaVUE H Series customers on September 30, 2013. 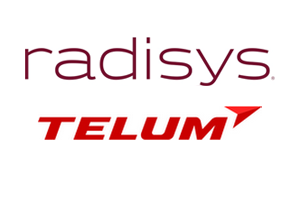 Radisys and Telum, which supplies military and professional radio communications systems in Russia, successfully integrated Radisys’ Compact Evolved Packet Core (EPC) with Telum’s compact LTE base station (eNodeB). For the interoperability test, Radisys’ Compact EPC was deployed remotely in San Diego, California and integrated with Telum’s eNodeB in Moscow, Russia, showcasing the ability to integrate an eNodeB remotely from the EPC. The test demonstrates how equipment, based on industry 3GPP standards, can interoperate in a private LTE network. 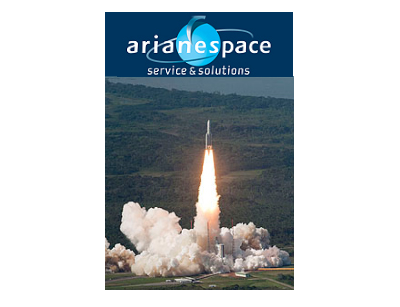 The companies said aerospace and Defense (A&D) and public safety contractors are turning to private LTE networks using carrier-grade quality and proven, commercial off-the-shelf (COTS) technology as LTE offers numerous advantages for private networks, including higher speeds and lower latency. The all-IP network is standards-based, allowing the military to take advantage of a large ecosystem of vendors for the radio and core networks, keeping network costs affordable and enabling interoperability. In addition, A&D contractors can leverage the broad availability of LTE smart phones in the market, replacing the clunky and expensive handsets associated with legacy private networks. 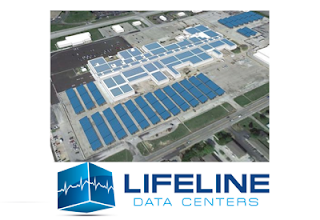 Lifeline Data Centers is planning to install a 4 megawatt solar power array at its Eastgate data center campus in Indianapolis, Indiana. Project completion is expected by April 2014. “I am very proud that Lifeline Data Centers is one of the first large independent data center facilities in the country to be largely powered by solar energy,” stated Lifeline co-owner Alex Carroll. The company noted that it now joins the likes of Apple, eBay, Facebook, and Cisco in the adoption of solar power as a clean and renewable data center power source that reduces dependence on the commercial power grid. Fusion-io introduced a software set for virtual desktop infrastructure (VDI) acceleration using flash in data center servers. 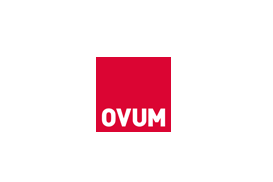 The company said its ioVDI software eliminates complicated VDI configurations with a simple server deployment model that delivers persistent desktop performance at a cost similar to stateless desktops. Fusion-io claims its software streamlines data requirements closest to the application at the VM level, consistently delivering less than 200 milliseconds of application latency and averaging at only 10 milliseconds. Without ioVDI, application latency can be as much as over 1800 milliseconds, with average latency at around 600 milliseconds. 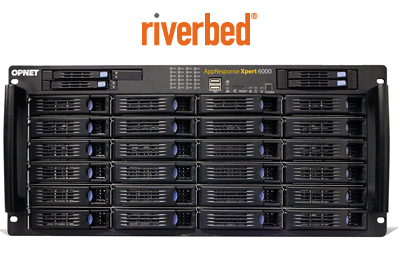 Fusion ioVDI will be available as stand-alone software and as an integrated solution featuring ioVDI software and Fusion ioCache virtualization acceleration platforms integrated into servers from Fusion-io Original Equipment Manufacturers. "With ioVDI software, enterprises can finally deliver a virtual desktop experience that is just as responsive as physical hardware," said Vikram Joshi, Fusion-io Chief Technologist and Vice President. "Writing data creates a storage bottleneck in virtual desktop infrastructure that is uniquely solved by ioVDI software. Using highly optimized algorithms, ioVDI fetches data from server-side flash, intelligently offloading most reads and up to 80% of the writes from primary storage to ensure ample storage resources for applications delivered virtually. Making efficient use of CPU and I/O resources with ioVDI allows for hundreds of desktops to be hosted on a single server without compromising end-user experience, which is absolutely critical to the success of VDI." HyTrust, a start-up based in Mountain View, California, raised $18.5 million in Series C funding for its Cloud Security Automation (CSA). HyTrust said its sales are on target to quadruple in 2013. The company’s cloud security platform delivers security, control, visibility, management and compliance to virtualized environments. The funding came from new investors Intel Capital and Fortinet, as well as recent investors VMware and In-Q-Tel. Previous investors Granite Ventures, Cisco, Trident Capital and Epic Ventures also participated in this round. Mellanox Technologies and Micron today announced a collaborative solution that combines Mellanox’s ConnectX-3 40GbE NICs with iSCSI over RDMA (iSER) and Micron’s 1.4TB P420m PCIe SSD cards. The companies said the iSER protocol enables Micron’s flash storage to serve virtual machines on a single ESXi 5.1 host with an aggregate bandwidth of 11GB/s or 527,000 IOPS using only two interconnect cards in a 3U box. The companies are demonstrating a Supermicro 6037R-TXRF server that supports 10 PCIe Gen3 x8 slots with two Mellanox 40GbE RDMA NICs and 8 Micron 1.4TB P420m PCI SSDs.